Would you like to convert Apple Music to WAV audio format so that you can share them with your friend who have PC only? Have you ever thought to transfer your downloaded Apple Music files to your Windows Media Player for playback? Regardless of whether you met the above problems or not, converting Apple Music to WAV is a necessary. In the following tutorial we will show you how to convert the downloaded Apple Music files to common WAV audio within some quick and feasible steps. Waveform Audio File Format, abbreviate WAV format, uses a standard digital audio file format utilized for storing waveform data. It is lossless, uncompressed, broadcast CD quality music files used on Microsoft Windows systems for raw and typically uncompressed audio. WAV files are also the right choice for loops to be processed with Flash for web animations. With Apple Music subscription streaming service, you are able to stream music for offline playing instead of purchasing music. This service is available for all iOS and macOS devices, but users are not allowed to move the downloaded tracks to non-apple devices without Apple ID signed in for Apple FariPlay DRM. Not to mention convert a song from Apple Music to a different file format. Don't worry, there are plenty of programs which can solve the problem for you. One of the best Apple Music Converter to WAV we'd like to recommend to you is Sidify Apple Music Converter. With it, you can convert Apple Music to common WAV audio without making an effort. 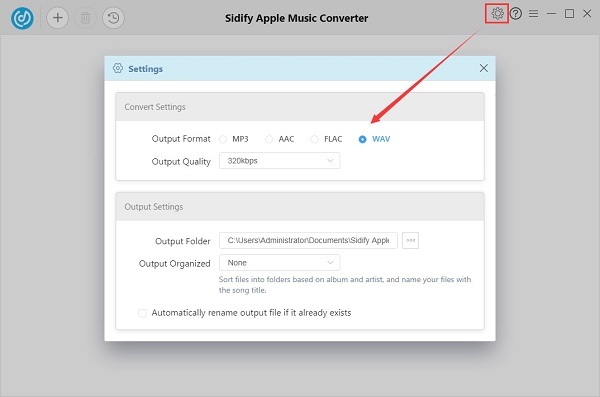 Sidify Apple Music Converter is an intelligent program that has no trouble in removing DRM protection from Apple Music by converting them to unprotected WAV with keeping original output quality. Furthermore, as long as the audio files can be played in iTunes, including iTunes purchased songs, Apple Music files, iTunes M4B/M4A or Audible AA/AAX audiobooks, this program can enable you to convert them to unprotected WAV, MP3, AAC and FLAC with simple clicks. Convert Apple Music songs to common WAV, MP3, AAC and FLAC. Support Converting Apple Music, iTunes M4P Music and Audiobooks. Losslessly record the Apple Music songs with ID3 Tags kept. Perfectly compatible with Windows 10 & latest iTunes. Install and launch the Apple Music to WAV Converter by clicking on the download button above. iTunes will open at the same time. Select the Apple Music files by clicking + button. From the pop-up adding window, you can choose the downloaded Apple Music files you want to convert. Click OK button and all your files will be added to the queue. The program supports batch conversion, you can add multiple files to the program, and all the files will be converted one by one. You can choose the output format as WAV or other formats like MP3 by clicking the setting gear icon in the upper-right corner of interface. Besides, you can also set the output quality and output path as you like. Now you can click Convert button, the DRM protected Apple Music to common WAV format conversion process will begin automatically. When Apple Music to WAV conversion completed, you can find the converted WAV files on history option. Now you can play the DRM-free Apple Music files in .wav format on Windows Media Player, VLC Media Player, iTunes, QuickTime, Microsoft Groove Music, and other popular media player as well.